Set in 19th century Java during the ruling of Sultan Hamza. When the sultan is murdered by Captain Van Trach and his Dutch soldiers, the sultan`s brother and sons, Arana, Jamar and Suwo, flee the country, ending up in the American Wild Wild West. Years later, the trio return to their homeland to avenge the sultan`s death. They will have to use the skills they learned during their cowboy way of life in order to track down and face the sultan`s killer. Along their journey, they meet several villagers, including the rebellious and beautiful headman`s daughter named Kiona, whom Suwo falls in love with. They find out that Van Trach still rules the area and now the village is in danger due to their presence, turning their quest for revenge into a fight for freedom. 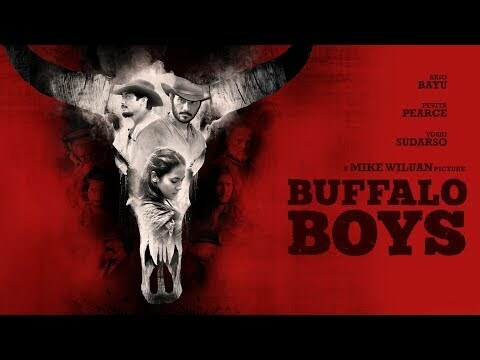 Buffalo Boys was released on VOD 105d ago in the US. Based on 6 Buffalo Boys VOD reviews, Buffalo Boys gets an average VOD review score of 60. The score for all versions is 60 based on a total of 12 reviews. Buffalo Boys is a messy, interesting, fun romp in cross-cultural interplay. Brothers raised in the Wild West journey to Dutch colonial Java to avenge their father's murder in this entertaining if depth-free genre cocktail. Singapore’s Foreign Language Film Oscar entry is an action-adventure that reinvents colonial Indonesia as the equivalent of a lawless Western frontier region.